The best way to compete for national titles is to stack one great recruiting class on top of another. Georgia has done exactly that lately, and Wednesday was no different when the Bulldogs put the cherry on top of a brilliant 2019 recruiting class. National Signing Day isn’t what it used to be now that the Early Signing Period in December has taken over. But the Bulldogs still had a huge day Wednesday, flipping a 5-star wide receiver who had been a longtime Auburn commit and snaring a much needed tight end. 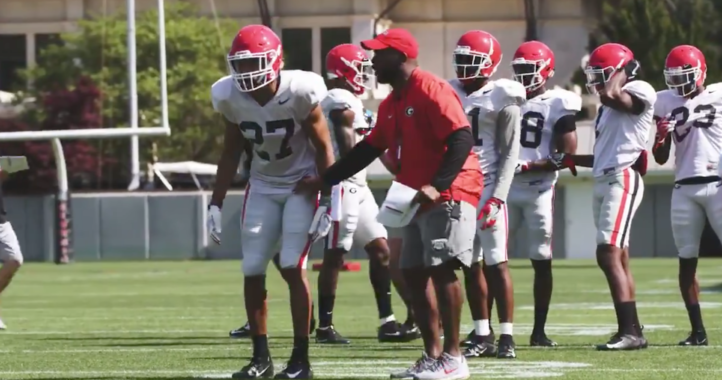 Georgia signed 22 players early, and 14 are already on campus, working out and taking classes. The two signees Wednesday were wide receiver George Pickens of Hoover, Ala., and Brent Seither, an up-and-coming tight end from Clearwater, Fla.
Georgia’s No. 2-ranked class sends a huge message that Kirby Smart and the Bulldogs aren’t going anywhere any time soon. This class fills a lot of gaps with superstars as well, and it sets the stage for Georgia to compete for conference and national titles again this fall. 5-star recruits (5): Nolan Smith, DE, IMG Academy; Travon Walker, DT, Thomaston, Ga.; Clay Webb, C, Oxford, Ala.; Nakobe Dean, ILB, Horn Lake, Miss. ; George Pickens WR, Hoover, Ala.
4-star recruits (15): Dominick Blaylock, WR, Marietta, Ga.; Bill Norton, DE, Memphis, Tenn.; Jermaine Johnson, DE, Independence (Kan.) CC; Zion Logue, DE, Lebanon, Tenn.; Xavier Truss, OT, Warwick, R.I.; Warren McClendon, OT, Brunswick, Ga.; Ryland Goede, TE, Acworth, Ga.; Rian Davis, OLB, Apopka, Fla.; Trezmen Marshall, ILB, Homerville, Ga.; Makiya Tongue, OLB, Baton Rouge, La. ; Lewis Cine, S, Cedar Hill, Texas; D.J. Daniel, CB, Milledgeville, Ga.; Tyrique Stevenson, CB, Miami. ; Kenny McIntosh, RB, Fort Lauderdale, Fla.; Dwan Mathis, QB, Oak Park, Mich.
3-star recruits (4): Tymon Mitchell, DT, Nashville, Tenn.; Tramel Walthour, DT, Hutchison (Kan.) CC. ; Stetson Bennett IV, QB, Ellisville, Miss. ; Brent Seither, TE, Clearwater, Fla.
Nolan Smith, defensive end: The Savannah native played his senior season at the IMG Academy in Bradenton, Fla., but he’s still considered to be very much a Georgia kid. That’s why it was so important to keep the No. 1-ranked player in the country in the fold. Georgia loves to rotate defensive linemen to keep them fresh, so you can pretty much guarantee that Smith will see plenty of playing time early. He’s already on campus and working hard, so he will certainly hit the ground running when spring practice starts. Considering that Georgia finished last in regular-season sacks in the SEC with only 20, adding Smith might help change that. Throw in fellow 5-star defensive tackle signee Travon Walker, and that Bulldogs defensive line could see dramatic improvement in 2019. Jadon Haselwood, wide receiver: The 5-star wide receiver from Ellenwood, Ga., was committed to Georgia for months before changing his mind in October. He committed to Oklahoma at the All-American Bowl in January. It’s a big loss for Georgia because they have suddenly gotten thin at wide receiver with Mecole Hardman and Riley Ridley leaving early for the NFL. Throw in senior Terry Godwin’s departure, and tight end Isaac Nauta’s early departure, and that’s four of the top five targets all heading out the door. Haselwood is a true star who could have helped immediately. Signing Pickens helped offset the loss. Still, Haselwood will be missed, and it sets up a position of priority in the 2020 class for sure. Clay Webb, offensive lineman: It was huge to get the No. 1-ranked center in the country in Clay Webb, for several reasons. 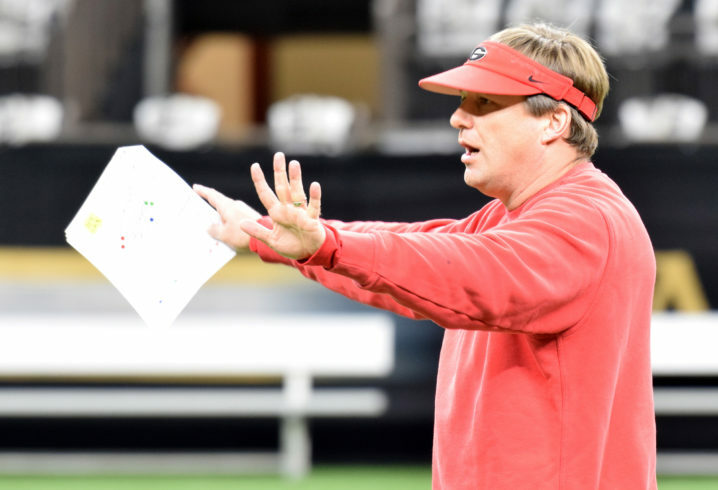 First, it’s become a priority with Kirby Smart to make Georgia tougher along both lines of scrimmage. That has been happening the past few years, and getting Webb means there’s more great talent along that line. Webb is from Oxford, Ala., though, and he was heavily recruited by Alabama. Nick Saban wanted him badly, but Webb flipped to Georgia just before the Early Signing Period. He has the size and skill to play immediately and he’l be a fixture in Athens for at least three years for sure. In getting Webb and Pickens, Smart signed the top two recruits from the state of Alabama. Stealing Pickens, the No. 4 receiver in the class, from Auburn was the heist of National Signing Day. Pickens had been solid with Auburn for months, and there was plenty of disgust on The Plains when he flipped Wednesday. He first committed to Auburn way back in 2017. Getting a second top player from Alabama is a massive deal, because it sends a message to top recruits nationwide — and even in the shadow of the mighty Crimson Tide — that Georgia can get many of the players they want. It will help going forward as well, as soon as 2020 when Georgia has plenty of targets in Alabama. Kaiir Elam would have been a nice get for the Bulldogs, but he got away on National Signing Day. Elam, a 4-star cornerback recruit from North Palm Beach, Fla., signed with Florida on Wednesday, his family ties to the Gators too much to overcome. One more cornerback would have been nice, but the Bulldogs are still in pretty good shape there. Dominick Blaylock, wide receiver: With numbers down at this position, Blaylock will get an early look for playing time. He was ranked as a 5-star receiver for most of the fall on the 247Sports composite, but has finished he recruiting cycle as a 4-star recruit. The signing of Pickens changes that a little bit, but not much. Pickens and Blaylock could both see early playing time. That star snub might add a little chip on Blaylock’s shoulder, too. He knows what it’s like to be on a big stage and he has plenty of support from his father, former NBA star Mookie Blaylock. It will be interesting to see how much of an impact he can make this fall. 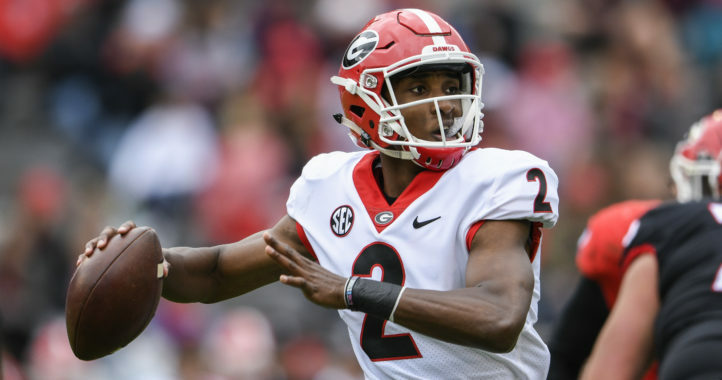 Dwan Mathis, quarterback: When Justin Fields started looking around to transfer, it became imperative that Georgia get a top-ranked quarterback in this recruiting cycle. That happened with Mathis, a long-time Ohio State lean, flipped to the Bulldogs. Fields wound up at Ohio State. Mathis is 6-6 and 205 pounds, and is the No. 11 pro-style QB in the 247Sports composite rankings. He will have to be ready quickly because he’ll likely be the No. 2 quarterback behind Jake Fromm in the fall. Fromm has been healthy throughout his two years at Georgia, but injuries are unpredictable. For sure, Saban is the king. Hats off to the historical class. Hope to see these recruits go at it soon. Likewise, 2 best recruiting classes in the country and it’s not close. Looking forward (hopefully) to another epic match up in December! Or even better, (unlikely) but another in January! Hopefully the match-up will go our way next time. Oh, it’s on! Love the battles, man. Saban is still king, for now. Very satisfied with this recruiting class at Georgia. Kirby went out and got who we needed to have an immediate impact and continue to build for the future. Very well done! UGA is loaded with talent at every spot. Not a single weakness on the roster. Nolan was definitely the most necessary signee, more so than Webb, with all due respect to him. Smith is a generational pass rusher who is originally from Georgia. We need sacks more than anything next season. I hope UGA doesn’t get too obsessed with star ratings and rankings….lol ole Clemson signed 29 guys and still finished in 10th place with like an 89 average. I hope UGA can end up developing talent as well as they evaluate/recruit it.